How to create a font category? Where can I set up a font category for a certain product? http://www.sifrgenerator.com/wizard.html - on the "Step 3" choose the "Letters, digits and common other characters" value, otherwise the font may not work. http://www.coffeecup.com/sifr-font-maker - for the "Glyphs" setting choose "Basic" value, otherwise the font may not work. You can create font categories for your comfort. For example, you may offer different products for personalization - t-shirts and business cards. For business cards you may wish your customers to use only standart fonts - Arial, Tahoma, Times New Roman, etc, so you can create a category for such fonts and make these fonts available for personalization of business cards. For t-shirts, for example, you can create a category with both standard and artistic fonts. To create categories for fonts, log in to the admin panel and go to Content -> Product Designer -> Font categories (http://demo.alt-team.com/admin.php?dispatch=product_designer.font_categories). Name - The name of your font category. Position - The order of displaying (position of the font category relatively to the position of the other font categories). Status - Active - font category will be available to work with; Disabled - unavailable to work with. 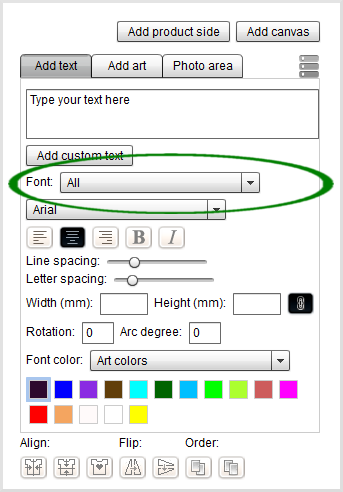 Press Create button to create a font category. To add fonts, in the admin panel go to Content -> Product Designer -> Fonts (http://demo.alt-team.com/admin.php?dispatch=product_designer.fonts). Name - The name of the font you are creating. Font categories - Your created font categories will be displayed here. Tick font categories checkboxes to which you would like to assign this font. Status - Active - the font will be visible to users; Disabled - the font will not be visible. 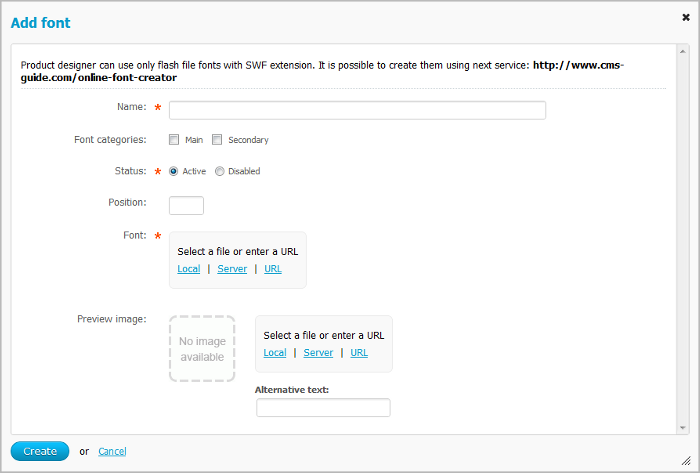 Font - Upload a font file .swf here. Preview image - If you wish, upload an image here which shows how the font looks like. Press Create button to create the font. If you have already created a product for personalization, you can set up a font category for this product. You will be able to set up a font category in Product designer tools display panel. Font - from the drop down list you can choose one of your created font categories. 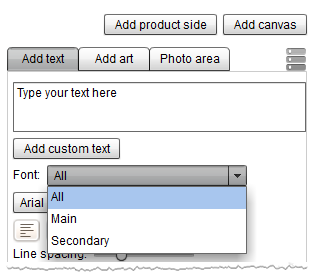 Fonts from a chosen category will be available for you/customers to choose from for text editing.